He later asked his colleagues Bjerknes to have a student working on a theoretical study of this problem: Ekman. Ekman assumed STEADY, HOMOGENEOUS and horizontal flow with friction on a rotating Earth. Hence, the horizontal and time derivatives are zero. DE is the Ekman depth, and has unit of meters. It is a representative scale (e-folding scale) for the solution. What does this solution look like? It's a spiral of currents that rotate and reduce with depth. Starting with surface velocities at 45° to the right of the wind. The e-folding scale is DE. Velocity vector rotates with "period" of 2πDE. 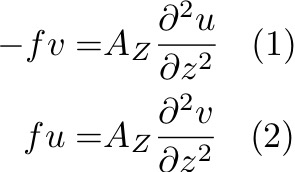 Ekman argued that the Ekman depth, a bottom of the Ekman layer, is where the velocity is in the opposite direction to velocity at the surface, which equals 2πDE. The observed instantaneous surface currents can be 30° - 60° to the right of the wind. 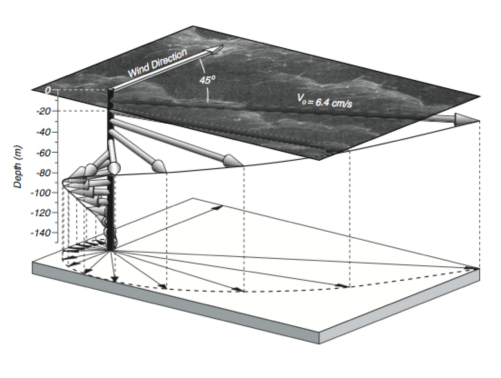 Maximenko and Niiler found that this angle varies as function of latitude. An explanation for this could be AZ and stratification. Another explanation is related to vertical variations of AZ, which is thought to grow linearly away from the sea surface. Which is the Ekman transport along the x and y directions. This is a very important result because the Ekman transport depends only on the wind stress and the Coriolis parameter. It does NOT depend on eddy viscosity or on the depth of the Ekman layer. Also, this result is valid even if the details of the Ekman spiral are not. Note that for a wind stress in any direction the Ekman transport is 90° to the right in the Northern Hemisphere and 90° to the left in the Southern Hemisphere.